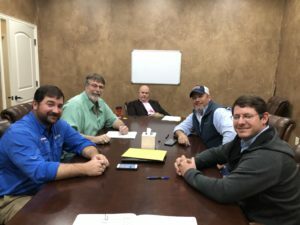 Sadler, Texas, February 26, 2019 - American Sport Fish Hatchery, based near Montgomery, Alabama, and Bob Lusk Outdoors pond management company, based in north Texas, announced the merger of their two companies. American Sport Fish, known as producers of outstanding quality sport fish, and especially known for their trademarked F1 “Tiger” bass, have been in business since 1986. In 2013, they expanded services to include pond management, dredging, and liming. Bob Lusk, nationally known private fisheries biologist, is in his 40th year. He’s considered a pioneer in the pond management business. Bob Lusk Outdoors focuses on helping landowners design, build, stock, and manage the best fishing lakes with healthy water, the best habitat, food chain, and management strategy they can have. The merger combines the strengths of both companies to blend their many years of knowledge, experience, and expertise, with their reputation for prompt, personalized, on the ground services. Shawn McNulty, Ph.D. Fisheries Biologist and one of the owners of American Sports Fish said, “We’ve been wanting a foot print in Texas to help landowners create their ideal lake or pond. It’s so much fun to help a landowner design a new pond or renovate an older one and then watch their family catch a fish of a lifetime”. Robby Mays, Fisheries Biologist, and owner added his thoughts. “Bringing our science background into managing people’s waters and watching them enjoy their property is a big part of what drives us to do what we do”. Lusk added his thoughts, “This merger combines all our talents and allows each of us, and our employees, to do what we do best. Small businesses have their own limits, but the synergy among us is exciting”. He added, “My favorite thing is to help landowners bring their dreams to life any way we can, from designing their lake to sharing years of experiences to help them learn different ways to enjoy their waters. I’m excited”. They’re poised and ready to assist any way they can and are ready to take on new clients. American Sport Fish Hatchery is one of the largest producers of live, freshwater fish for stocking ponds and lakes in the southeastern United States. American Sport Fish also offers pond management services for lakes and ponds. Bob Lusk Consulting offers full-service lake and property management from assessment to fulfillment. Bob Lusk Outdoors focuses on helping landowners design, build, stock, and manage the best fishing lakes.